For FIRST Alumni Amanda and Robert Stephenson, FIRST is a family affair. 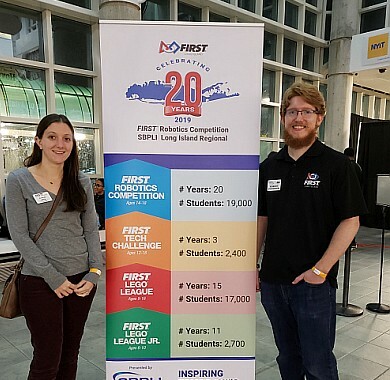 Amanda, from FIRST Robotics Competition Team 527 “Plainedge Red Dragons,” and Robert, from FIRST Robotics Competition Team 871 “West Islip Robotechs,” met in college when Amanda recognized Robert’s FIRST team shirt on campus. Now, the FIRST Alumni are married, volunteering alongside other family members at FIRST events, and newly appointed FIRST Tech Challenge Partners on Long Island in New York. After becoming FIRST alumni, Robert and Amanda both attended (FIRST Scholarship Provider) Stevens Institute of Technology for undergrad. While Robert majored in electrical engineering, Amanda majored in mechanical engineering. They met officially in their sophomore year of college, when Amanda recognized Robert’s FIRST team shirt on campus. The two are now married and have stayed heavily involved with FIRST. Currently, Amanda works in HVAC system design for buildings in New York City. Her last college internship was in HVAC design and she really enjoyed it. She plans to continue working in the field and achieve her professional engineer’s license. Robert is currently a network engineer at Nomura. He started taking network engineering courses in college and found himself drawn to it. He also plans to continue in his field in the finance industry. They are looking forward to growing their FIRST Tech Challenge Long Island community and growing in their roles as partners. There are a few things Amanda and Robert’s FIRST experience helped them accomplish post-graduation. Amanda applied to Stevens Institute of Technology after hearing about the school from a graduating teammate. Amanda and Robert both had FIRST leadership experience that helped them land internships their sophomore year of college. They have been able to offer community outreach opportunities with FIRST for their companies. Finally, they have been able to cultivate a network of fellow engineers, past teammates and volunteers that make our FIRST family great. You’ve continued to be involved with FIRST as an Alum; what have you been up to? FIRST has become a family affair for the Stephensons. Robert started participating in FIRST at the age of seven, when his dad began mentoring FIRST Robotics Competition Team 270 in 1998. Later Robert and his sister both became members of FIRST Robotics Competition Team 871. Amanda joined FIRST Robotics Competition Team 527 at the start high school. Both Amanda and Robert stayed involved with FIRST during their college careers. Robert volunteered for FIRST Robotics Competition as a referee and robot inspector, while Amanda volunteered as field reset. After college, they began volunteering across all of the FIRST programs on Long Island. Currently they are co-partners for FIRST Tech Challenge for Long Island. Their partnership works well as they have complementing strengths. Robert is more technically/robot focused, and Amanda is more detail oriented. If you’re ever at an FIRST Tech Challenge event in Long Island, you’ll be sure to see the whole family there! Robert’s mom is a lead queuer and his dad is a robot inspector and referee. You shared that you’ve made and kept great FIRST friends/established a great network within the FIRST community – any advice to current participants on how to do that? Volunteer! Volunteering will keep you active within the FIRST community, even after graduating. Every position either at an event or with teams directly allows you to grow your contacts within FIRST. You’ll start seeing familiar faces at each event you attend, and they slowly turn into a family reunion. Don’t worry about starting too small or jumping right into a position out of your comfort zone; there's is always someone to help.